- Caresoft Global was recognized for its innovation in the area of full vehicle competitive benchmarking using Computed Tomography. Caresoft Global has pioneered a game-changing technology and process to gain engineering insights and actionable intelligence on today's vehicles using High Energy CT Scan data of vehicles. Caresoft Global's patent-pending process is utilized to created highly accurate and detailed 3D engineering data of full vehicles that can be used for many advanced engineering simulations such as virtual crash analysis and electrical simulations. Caresoft Global has also deployed the entire vehicle data into their proprietary Virtual Reality simulation platform – Cornea Extended Reality suite. In this extended reality platform, customers can visualize the entire vehicle assembly and collaborate and do design reviews from anywhere in the world in Virtual Reality. Caresoft Global's technology has reduced the R&D timeline for its customers and transformed product development strategies. The company has deployed this new technology in over 45 global auto manufacturers and their suppliers to help reduce product development costs and lead times. "The global automotive industry is undergoing its most profound and disruptive shift since the introduction of Karl Benz' Patent-Motorwagen nearly 135 years ago. At this stage, there is no question that the industry is driven by technology levers such as electrification, AI and autonomous driving systems, while manufacturing decisions are increasingly motivated to preserve our natural environment. At Caresoft, we play a vital role in this transformation," said Mathew Vachaparampil, President and CEO of Caresoft Global. "We don't view ourselves as a benchmarking company, but rather a critical path technology partner enabling our customers to dramatically shorten the time required to bring their products to market, and to substantively increase their competitiveness. We work side-by-side with our OE and Tier partners to deliver the most relevant data and knowledge in order for them to function as the disruptors rather than the disrupted. Our technology and analytical benchmarking tools provide immediate actionable intelligence, and our cutting-edge VR and AR suites accelerate virtual validation. We will continue to influence R&D strategies at the leading manufacturers and suppliers and help transform their product roadmaps." "The PACE award has reaffirmed that our solutions provide measurable outcomes for our customers and motivates us to push even further the boundaries of what we can do to support our customers' requirements," he added. The 25th annual PACE Awards were presented by Automotive News, and the Automotive Parts Manufacturers' Association (APMA). The Government of Canada was a platinum sponsor. The competition was open to suppliers who contribute products, processes, materials or services directly to the manufacture of cars or trucks. The Automotive News PACE Award is accepted around the world as the industry benchmark for innovation. Caresoft Global earned an Automotive News PACE Award following an extensive review by an independent panel of judges including a comprehensive written application and a site visit. 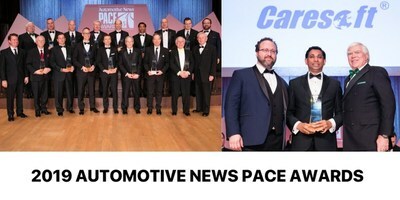 For complete details of the Automotive News PACE Award, visit www.autonews.com/pace. Caresoft Global is a technology-driven engineering solutions company working in the areas of Automotive Benchmarking, AR & VR technologies, Product development, cost optimization, and aftermarket strategies. Caresoft Global works with over 100 manufacturers from more than 20 global locations in North America, Europe, Asia, Australia, Africa, and South America.